Everton XI: Howard, Galloway, Funes Mori, Stones, Coleman, McCarthy, Barry, Deulofeu, Barkley, Kone, Lukaku. Villa XI: Guzan, Hutton, Richards, Clark, Richardson, Gana, Westwood, Veretout, Gil, Grealish, Ayew. Right then, I'm out of here to sum that up in a match report. Keep an eye out for it. Until then, follow reaction in our main Premier League live text. "Everton finish with four, Villa finish with nothing, which is exactly what their performance deserves." That's yer lot in one of the most one-sided Premier League games you will ever see. Everton excellent, Villa awful. Three minutes added on. Three too many for Villa. Lukaku soldiers on, still smelling a hat-trick. We're almost into added time. This looks painful for Brad Guzan, whose afternoon goes from bad to worse. He collides with Lukaku and stays down, but is up after treatment. In fact, it is Lukaku who hobbles away. I'm loathe to say it's petering out, because Everton still look dangerous every time they go forward. However, the sting isn't quite there any more. Darron Gibson is on for James McCarthy. Nathan, Walsall: It's plain to see Villa are doomed! We cannot play together and experienced players are just not stepping up. Personally I think Remi has no chance. The style of football he wants to play, his players just don't have the quality to do it. We are not a possession team as we simply don't know what to do with the ball when we have it! See you next year Walsall! The Villa fans are still singing, a top-class performance from the travelling fans that their team barely deserve. Remi Garde stands on the touchline, the face of a worried man. "What have I got myself in to?" Steve, Bristol: Please, please, please Remi, don't pick Guzan again. Problem half-solved. Just need to find a striker too. And then some more defenders. And a creative midfielder. Oh dear. Not looking good. "When Ross Barkley, Gerard Deulofeu and Arouna Kone are all on song, Everton are going to hammer you. And that is exactly what has happened to Aston Villa today." "It's all going wrong for Aston Villa. The new manager came in and momentarily stopped the rot, but I am sure Martin Keown will pull that Villa defence apart on Match of the Day tonight. Some of their defending has been abysmal." "Goodison Park is loving this, but it's been a pretty sorry display by Aston Villa today." What a wonderful, wonderful goal. The three players who have ripped Villa apart today combine for Everton's fourth.Gerard Deulofeu runs through the middle, feeds Ross Barkley, who needs only one touch to slip in Romelu Lukaku. He lifts over Guzan, then celebrates by dancing with Arouna Kone. Lovely stuff. Villa make an attacking move, replacing Carles Gil with Rudy Gestede. Villa's task is to get the ball somewhere near him. "Everton’s players could conceivably take it a bit easier second half in order to save themselves for the next game, they have got experienced players who will approach the game in a savvy way." "There's a sort of quiet appreciation around Goodison at the moment." All a little subdued at the moment, as if both teams sense this contest might already be over. Goodison is becalmed. Ooohhh, Villa nearly in. A mistake from Funes Mori almost let in Veretout, but Tim Howard was very switfly off his line. Back under way. Surely it can't get much worse for Villa. Can it? Villa have made a change, swapping Idrissa Gana for Carlos Sanchez. Good luck, son. I might be getting a little excited with the graphics, but I keep finding more ways to demonstrate the gulf between these sides. The heatmap on the left shows where Everton have had the ball, so much in the Villa half. On the right, you can see that Villa have barely got into blue territory. Romelu Lukaku's goal was his 50th in the Premier League. Only Robbie Fowler (92), Michael Owen (91), Wayne Rooney (71) and Cristiano Ronaldo (54) scored more before their 23rd birthday. I've just overheard someone in the press box saying Villa are a "dreadful, dreadful team". I think that sums it up quite nicely. Colin R Docherty: Everton doing to Remi Garde what they did to Sam Allardyce - giving them a reality check! "What this performance says to me is Aston Villa's problems weren't just down to Tim Sherwood - the owners have to realise that now." The whistle goes, bringing to an end the most one-sided half of football I've seen all season. Everton are cruising. Villa are shambolic. "I cannot wait for Martin Keown to destroy Aston Villa's defending on Match of the Day this evening. It is comical - the ball bounced three times in the penalty area." This is embarrassing for Villa, not only the scoreline but defending straight from the circus. A simple chip into the box is not dealt with despite the presence of four defenders and the on-rushing Brad Guzan. Eventually, Ross Barkley strolls in and again has an empty net at his mercy. This game is already done. Look at how much of Everton's attacking play is going down their right. That is where Gerard Deulofeu has Kieran Richardson on toast. Oooohhh, Everton only a Micah Richards right boot away from being three up. A rare Villa attack got only as far as the edge of the Everton box. From the counter, Richards just managed to intercept a Deulofeu pass, otherwise Lukaku had only Guzan to beat. It's just gone a little quiet. By quiet, I mean the Everton wave of attack has halted, more through their own relaxing, rather than a Villa improvement. The Blues still have exclusive possession of the ball, mind. "You feel the only thing that could stop Everton here is complacency." A further illustration of Villa's problems - not one of their players has an average position outside of their own half. Looking again, Lukaku had an initial chance that was blocked. The ball ran free, Coleman pounced and Lukaku was back on his feet to head in. Villa defenders were playing hide and seek. "Romelu Lukaku is a big strong player, and he collided with Micah Richards, but Lukaku springs up and puts the ball away. There were claims it might have been a foul but for me that is the most impressive thing about the goal - the quickness of his reaction to get up." This really could be a rout. Everton have a second and Romelu Lukaku joins an exclusive club. The Toffees get more joy down the right, Seamus Coleman dinks the ball in and Lukaku has a simple header to become only the fifth player to notch 50 Premier League goals by the age of 23. "Kone was not expecting Guzan to keep that out. It's a really good save." Villa almost come a cropper in some danger of their own creation. Jordan Veretout gives the ball away, starting an Everton attack that Villa scramble away. Everton come again, Arouna Kone denied from close range by a wonderful Guzan save. One-sided is an understatement. Just to illustrate how much this game must change if Villa are to get back in it, have a look at the action areas so far. How do Villa respond? If the plan was to sit on a point, that has gone out of the window. It's probably good for the game that the visitors now have to come out and play. "It was a lovely build-up and simple finish for Barkley. Any Everton fears of frustration were lifted in that moment. "Two fantastic flicks in the build-up, and there were five or six players queuing up to score - they were desperate to put one away. If they carry on on the offensive here they could get two or three. It's worrying for Aston Villa." Has this been coming? Villa had managed to hold back the tide, but you can't say Everton don't deserve their lead. It's lovely football from the Toffees, involving Romelu Lukaku and James McCarthy, eventually with Gerard Deulofeu getting in the shot. It was saved by Bard Guzan, but straight to the feet of Ross Barkley, who had the simple task of tapping into an empty net. Now then, the first sign of goalmouth action. Seamus Coleman is in there, getting in a shot after wrestling with Kieran Richardson. Unfairly, says the ref, so Guzan's save was not needed. "If you've taken over as captain of a ship that is sinking, your first job is to plug the holes. That's what Remi Garde seems to have in mind today." Now then, an Everton free-kick from the right, coming about after Kieran Richardson pretty much slaps Gerard Deulofeu. Nothing coming from it, not the resulting corner. Everton not making the most of their possession, they haven't worked Brad Guzan yet. It's like a training ground game at the moment, a cross between attack v defence and keep ball. Everton in almost exclusive possession of the ball, Villa trying desperately hard to get a kick. Still Everton push, this time getting as far as the Villa box before the attack breaks down. There's a lot of claret shirts back there, lots of running around without actually seeing the ball. A very loud tannoy announcement tells us to remain seated. Yes, ma'am. Villa can barely get it out of their own half. Everton are defending on the halfway line, like a rugby team protecting the 22. Brendan Galloway is seeing plenty of the ball. Everton come again, a lovely cross-field pass from John Stones finding Brendan Galloway with chalk on his boots. The cross is cut out and Villa have a throw in their own right defensive corner. I'm not sure Villa had a touch in those first couple of minutes, they barely got close to the ball. It needed an Everton long ball to skip on and out of play for the visitors to get it. 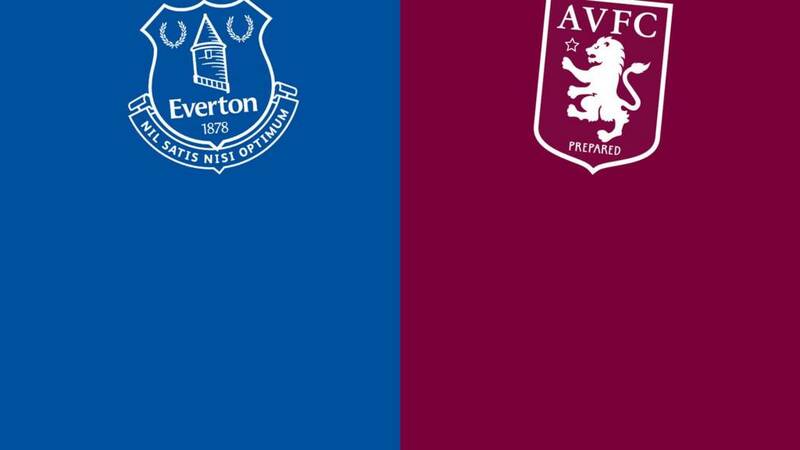 Both teams are as we know them best - Everton in blue and white, Villa in claret and blue. Everton are attacking the goal to the left as I watch on. As at every Premier League game this weekend, we hear the French national anthem, La Marseillaise. The players have lined up, not confined to their teams. There are some French flags in the crowd, while Remi Garde is singing. Warm handshake between Roberto Martinez and Remi Garde, part of the new breed of suave manager. They're generally better dressed these days, football bosses. Z-Cars plays, the players emerge from the tunnel, the referee grabs the ball. It's brass monkeys at Goodison, so most of the crowd are wrapped up like presents under the Christmas tree. Everton defender John Stones could play for the best clubs in world football, including Bayern Munich, Barcelona and Real Madrid. That's the view of former Manchester United defender Phil Neville, who also likened the England international to Rio Ferdinand. "I think he can play, not just at the best clubs in England, but at the best clubs in Europe. I really do," Neville, now Valencia's assistant coach, told BBC Radio 5 live. "One of the big boys in Spain, or Bayern Munich - I think he's at that level. They'll be looking at him and thinking this boy is something special." Listen to Neville's assessment here. "Garde got off to a good start with a point and a clean sheet, but Villa still did not look like scoring and usually, when you allow the opposition as many chances as City had, then you end up conceding a few goals. "Everton were solid enough against West Ham in their last game and I just cannot tip Villa to go away and get anything at the moment." Everton are unchanged from before the international break, but Remi Garde makes three changes to his Aston Villa side. Keiran Richardson, Ashley Westwood and Jack Grealish are all recalled. Everton: Howard, Galloway, Funes Mori, Stones, Coleman, McCarthy, Barry (c), Deulofeu, Barkley, Kone, Lukaku. Villa: Guzan, Hutton, Richards, Clark, Richardson, Gana, Westwood, Veretout, Gil, Grealish, Ayew. "The most frequently played fixture in England gets a 219th outing, a little over 127 years since Villa won the first 2-1 at their Wellington Road ground. "It may be a measure of the clubs' similar stature - or just a mathematical anomaly - but each has enjoyed 80 wins against the other, with 58 draws." His obstacle is a trip to Goodison Park to face an Everton side whose inconsistencies have seen them bounce around in mid-table. A draw at West Ham last time out followed a 6-2 home thrashing of Sunderland. The Toffees, though, haven't won back-to-back home games since April. But the anti-Marx, the James Madison, in this story, has arrived in the shape of Remi Garde. A creditable goalless draw with Manchester City was earned in the Frenchman's first match in charge, but now he is looking for a first victory, one that would go some way to cutting the five-point gap to safety. And that danger comes in the shape of yet another Aston Villa flirtation with relegation. I say flirtation, but it's more serious than that. It's not flirting, but a full-blown dangerous romance that has so far taken in 12 dates. It's no love story, mind. And could end in tragedy. Or farce. See, as you may well be aware, this is the most played fixture in English league football. Today is the 219th outing. However, that particular bit of history is in danger of being denied the opportunity to grow any further. It was Karl Marx who said "history repeats itself, first as tragedy, second as farce".